White Oak. It has a neutral wheat color with consistent grain, and allows nearly unlimited stain and finish possibilities, including European bleeds, wire brushing and rift and quarter sawn cuts. It is highly sought-after for its durability, versatility and long life. For this, it has been a top requested species for centuries in both residential and commercial interiors. Below are 5 reason why White Oak is a great hardwood floor. 1. White Oak is durable and known to last for centuries. Out of the two Oak species, White Oak shows up on the Janka Rating scale as a bit harder than Red Oak – 1360 for White Oak compared to 1290 for Red Oak. Janka Rating is the measure of resistance of wood to denting and wear, but be aware that this does not factor in the impact of scratching. It’s a great species to hold up to the everyday wear and tear of kids, pets, or heavy traffic. White Oak has been a top preferred species for many years as to why you will find it in many older homes. Some older homes with White Oak floors just need refinished and a little TLC. 2. White Oak flooring can be cut in multiple ways. This species has the capability to be sawn in various ways that display cathedral (Plain Sawn), fleck (Quarter Sawn) and linear (Rift Sawn) grain patterns. Live Sawn is another option, which includes all three grain patterns together on one board. Each cut shows the beauty within a White Oak tree with the crisp clean lines to the waves of mineral streaks running across the board. Each cut has its own stability, for example, Rift & Quartered is more stable than Live Sawn. If you want to read more about the different cuts, see our blog Different Cuts of Hardwood Flooring. With this species, there are many options to choose from. 3. Color options look better on White Oak. White Oak has large open pores that absorbs stain readily. Since it’s very easy to stain, there are numerous stain and finish options to choose from with this species. From stains that cast golden hues to create warmth, rich coffee brown tones to make a bold statement, or creamy grey shades for a calming environment, the color options are almost endless. Different colors can be used on other species but since White Oak lays a nice blank slate with its neutral wheat color, the hues appear better and even across the board. 4. White Oak is versatile among interior design styles. White Oak is a popular option from contemporary to rustic interior designs. A select White Oak shows growth rings that are much closer together so the grain has a more of a uniform flow, making it look smooth and clean. These tight smooth grain patterns are sought after for contemporary and modern homes. If you want a farmhouse or distressed look, White Oak in its natural character state is the best option. 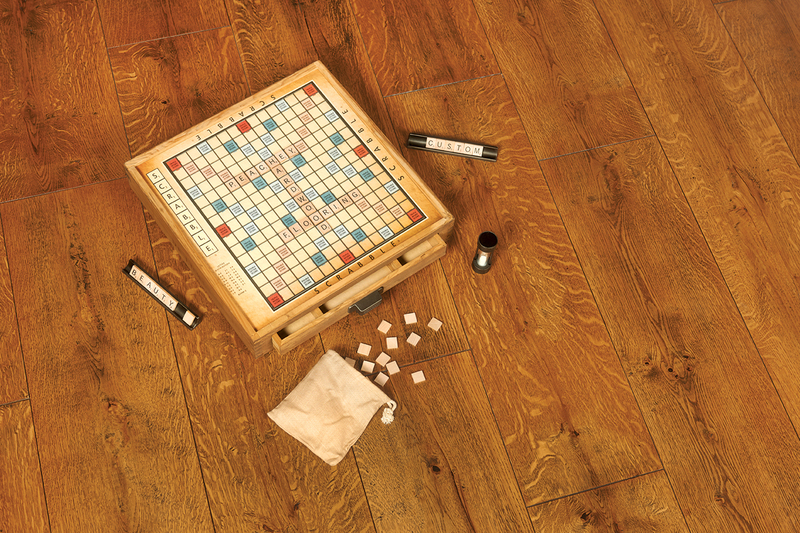 White Oak has a neutral palette so your eyes focus more on the knots and other imperfections. In addition, skipped planed or black bleed treatments add the perfect touch for a little more rustic flare. 5. Long lengths and wide planks. White Oak originated in North America and has spread to where it’s an easily available species and attainable at great lengths. The traditional White Oak strips are still offered but today’s consumers are seeking for wider and longer boards. They display more of the natural charm and grain pattern cascading from board to board. At Peachey Hardwood Flooring, you can find above average widths up to 16” wide and lengths up to 12’ long. Overall, White Oak is a great hardwood flooring species with its durability, stability, and versatility. If you would like to learn more on White Oak hardwood floors, visit our website or give us a call at 717-667-9373 and our experts at Peachey Hardwood Flooring will be happy to assist you.